Apple's "Let's meet at our place," event from the Steve Jobs Theatre, has just concluded. In the wake of the detailed leaks over the weekend there weren't a lot of surprises to be had, at least not with regard to the headlining hardware. 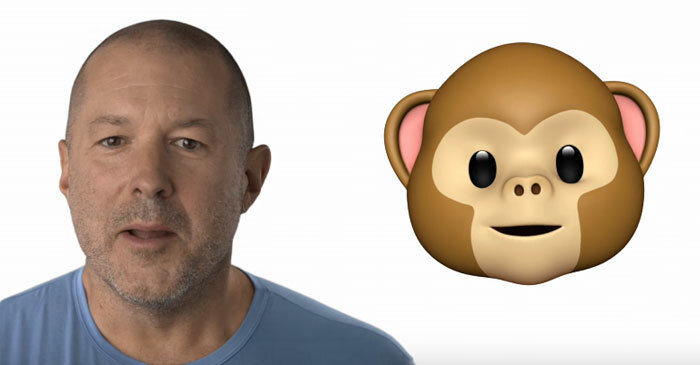 Apple took what seemed like an eternity droning on about its third generation Watch, with built in cellular connectivity, and then the Apple TV with 4K capabilities before moving on to the main attractions. Then Phil Schiller came on to reveal and chat about the new iPhone 8 and iPhone 8 Plus. Finally CEO Tim Cook took to the stage to present "one more thing," the highly anticipated iPhone X. He described the tenth anniversary Apple smartphone as "the biggest leap forward since the original iPhone". 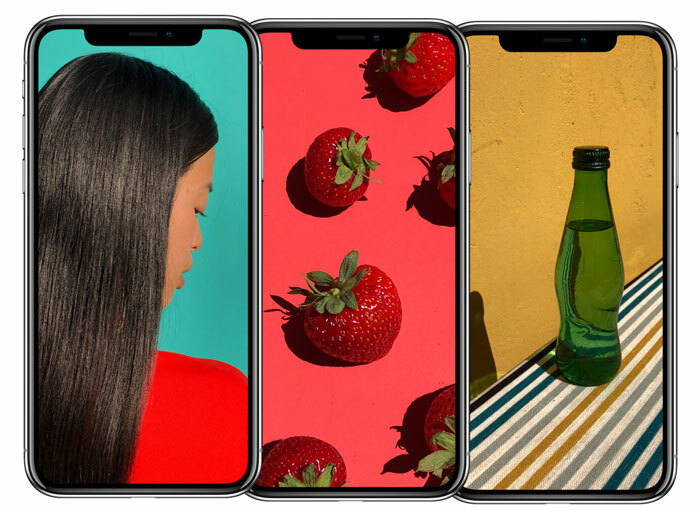 As we expected, the Apple iPhone X (pronounced iPhone ten) boasts a big step up in screen technology for Apple. The new device is built around a 5.8-inch OLED display with a million to one contrast ratio and 'True Tone' HDR. This so called 'super Retina display' boasts 2.7 million pixels (2436 x 1125 / 455ppi) and takes up almost the whole front surface. So the Home Button is gone, instead you swipe up to go to Home. You wake up this iPhone X with a touch and it can be unlocked with Face ID when you look at it. Meanwhile Siri has been moved to a new side button. 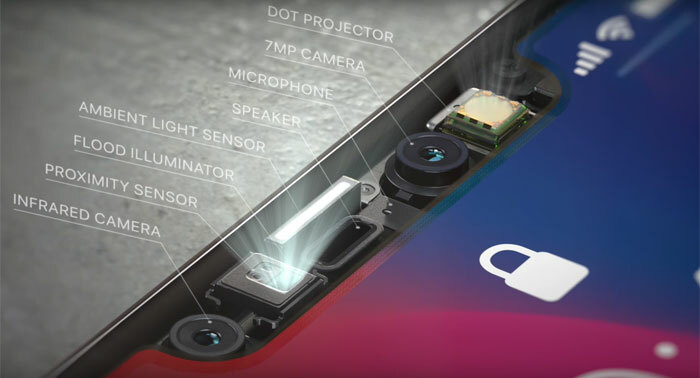 Facilitating the Face ID security is a 'TrueDepth camera system' with camera, 3D sensor, and IR camera which allows it to work in the dark. Face ID is said to learn who you are with glasses, hats, or a beard thanks in part to Apple's Neural Engine chip and machine learning. Apple promises this secure unlock and authentication method can't be fooled by photos or masks. There is however a million to one chance someone shares enough facial features to get your phone to unlock - that's better than the claimed one in 50,000 of the Touch ID system. The main (rear) camera system on the iPhone X consists of a pair of 12MP cameras (wide angle f/1.8 and telephoto f/2.4) with larger and faster sensors, and OIS for both cameras for the first time. There are four LEDs for bright and colour accurate flash. 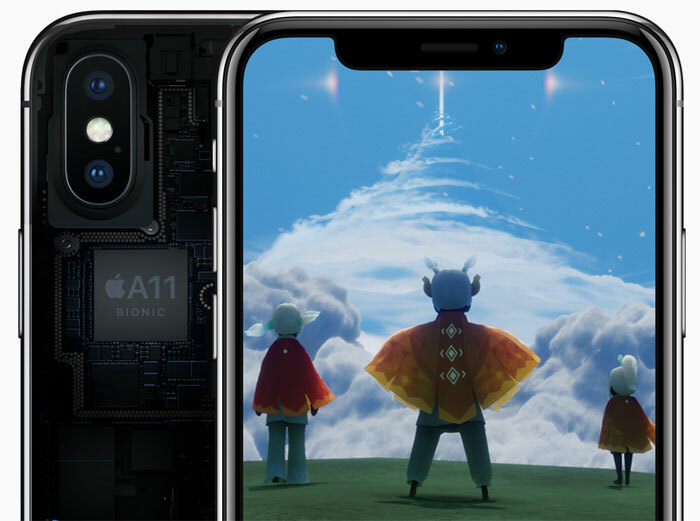 Powering the new iPhone X is the A11 Bionic (with neural engine) processor. Apple claims this to be up to 70 per cent faster than A10 Fusion. Furthermore, the performance cores are up to 25 percent faster. 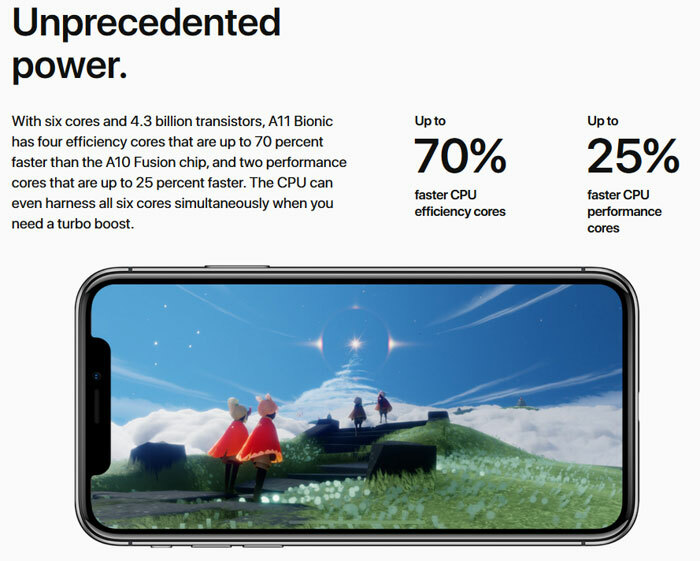 Apple's in-house triple-core GPU design debuts and offers 30 per cent faster graphics acceleration compared to the A10 Fusion. The SoC is good enough for "extraordinary augmented reality experiences in games and apps," claims Apple. METAL 2 and CoreML are supported for graphics and application acceleration. Qi wireless charging is supported by all the new Apple gear announced tonight. That's great except for one small thing; Apple's own AirPower mat won't be available until next year. At least Apple is using an industry standard here though, so you can use the various Qi chargers already available in hotels, offices, cars, cafes etc. Belkin and Mophie already have new chargers ready to complement the new Apple devices. Another bonus of the iPhone X is that battery life is said to be two hours better than with the iPhone 7. Other important details include the IP67 water and dust resistance, the construction from surgical steel (two finishes: space grey and silver), the dimensions of 144 x 71 x 7.7mm, and weight of 174g, and the 12 Animojis available. Full tech specs are listed here. Apple iPhone X mobiles will become available for pre-order from 27th Oct with availability set for 3rd Nov. Devices will be available priced at $999 / £999 for the 64GB version, and $1149 / £1149 for the 256GB version. I can not wait!!! Apple take my $$ the BLACK X is calling my name. I think I must be going deaf…. Can't see any compelling reason to upgrade from my Iphone7 which still does all I need from a smartphone. I guess the additional processing power is required to do the facial recognition thing, and while the home button may have gone (which may or may not be an improvement, depending on your POV) it has gained an extra side button to activate Siri. I'd like to say that surely this time it is at a price point that will make people stop, think, and then decide against it, but unfortunately I know that some people (particularly those who see it as a status symbol) will still be willing to pay it anyway despite how ridiculously high it is. Personally, I just can't fathom how anyone can justify to themselves that paying such an amount is worth it. A bit on the pricey side that X variant.. By the way the iPhone SE is £299 at Argos and Currys/PCWorld. I just can't fathom how anyone can justify to themselves that paying such an amount is worth it. Because most people can easily afford £55 per month as a status symbol, and Apple will happily finance you the product on a 24 month plan.